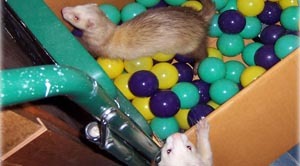 INDOOR FERRETS: How to keep ferrets indoors. Thank you to Donna Brooke who kindly wrote this section regarding indoor ferrets. 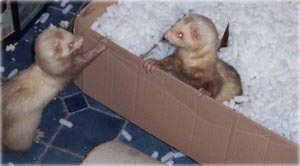 Despite many people’s reservations, ferrets can successfully be kept indoors. There are certain things to consider when deciding to keep ferrets indoors which are different to outdoor matters. The most important thing (apart from housing) is making sure your home is “ferret proof”, especially if they are going to have free range of the whole house. You will need to ensure there are no electrical cables they can come to harm with and that sockets are turned off if they don’t have a plug in them so they can’t electrocute themselves when they stick their noses in them. It is very important that visitors to your house know the ferrets are running around so that they don’t accidentally let them out of the house or stand or sit on them and injure them. You will also have to get used to making sure that doors are closed to the areas your ferrets are not supposed to be in and that you check when leaving or entering the house that a ferret isn’t sneaking through the open door into the great outdoors. You need to consider the fact that they are nosey creatures who will try their hardest to get into the tiniest gaps and holes so you will need to be vigilant about blocking them up. If you think they will never get in the gap, they probably will, so fill it anyway or you could find yourself with a trapped ferret. You could end up with a very expensive plumbers bill if your ferret got stuck behind a radiator for instance. Ferrets love to steal so put away anything you don’t want to lose or learn quickly where their hiding places are or you may find yourself saying to your boss “sorry I’m late, my ferrets hid the car keys” They also like to dig so any plant pots you have will be fair game, as will the cat’s litter tray and any food bowls you have down for any of your pets. They can also find their way into cupboards and draws so you need to make sure that you have door locks or hooks and eyes on the doors you don’t want them to open (including your fridge door). If you are having a dedicated “ferret room” you will only need to do these things for that chosen room and be very careful about opening the door when they are out of their cages. You will also need to consider cleanliness. Ferrets are creatures of habit. They always use the same spots to toilet in so you should try and train them to use a litter tray. If you put the trays in the spots they normally use and persist in putting your ferret in the tray whenever you see signs of them going to the toilet they should soon get used to using it and do it on their own. Alternatively if you are having a ferret room choose flooring that is easily cleaned such as lino. 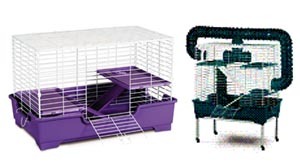 Your ferrets will need somewhere to call home even if they roam freely around the house. They will still need a place to sleep, eat and feel safe and you will sometimes need to confine them if they are ill or you just need a ferret free zone for a while. You can, of course, use an ordinary outdoor hutch inside but there are lots of indoor cages designed with ferrets in mind. Obviously you need to make sure the cage is big enough for the number of ferrets who are going to live in it so choose carefully or you could end up making an expensive mistake. Cages with wire floors are not recommended, as they will damage the ferret’s feet. If you do buy one with wire shelves then it would be advisable to cover them with lino. 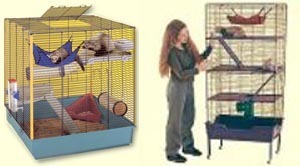 If you don’t want to buy a cage there is always the option to build one. To keep ferret smells at bay, it is essential to remove all the soiled bedding and replace any hammocks that need washing on a regular basis. All ferrets like to play. If they live in a cage they need some exercise time and toys to keep them occupied. Most cat toys are safe but be aware of toys that contain bells and check them for wear, a bell could be fatal if swallowed. The same goes for rubber balls. If a piece of rubber were swallowed it would very quickly cause an intestinal blockage. They also love plastic carrier bags, the noisier the better, and tubes of any kind. It is advisable to cut the handles off carrier bags to ensure your ferret doesn’t become entangled. Other things to consider are that a warm house will affect your ferret’s coat and he/she may not develop a proper winter coat. They may also get dry skin from the heat. Ferrets don’t like to be too hot and suffer very quickly from heat stroke. Try to keep the temperature in their room as much like outside as possible, however cold it gets. Put a coat on and warm your hands up on the ferrets if the temperature drops too much for you. Ferrets normally come into season with longer daylight hours (photoperiodism). In spring entire ferrets that are exposed to artificial light when living indoors can come into season at times that are not natural for them. If you don’t have your ferret either spayed or castrated then you need to keep the light cycle as natural as possible for them. It’s also good for them to have time outside if at all possible so an outdoor run or a ferret proof garden would be very much appreciated. If you can teach your ferret to wear a harness you can take them out for a walk.